We have three or four cholla cacti on our property. Impressive, pretty cacti, but we were disappointed last year that they never bloomed. They looked like they were forming buds ... and then one day the buds were gone. We thought maybe some animal ate them before the flowers had a chance to open. Not this year! All of our chollas have gone crazy, with the early rain followed by hot weather. Last week we thought they were spectacular, but they just kept getting better and better. In the heat of the day, it's a bee party: they're aswarm with at least three species of bees and wasps (I don't know enough about bees to identify them, but I can tell they're different from one another) plus some tiny gnat-like insects. 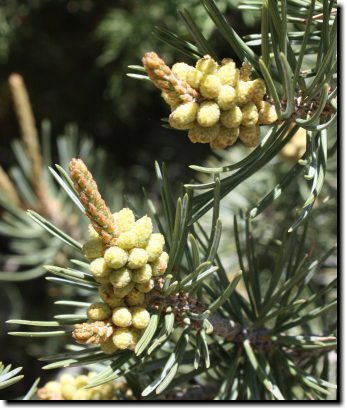 I wrote a few weeks ago about the piñons bursting with cones. 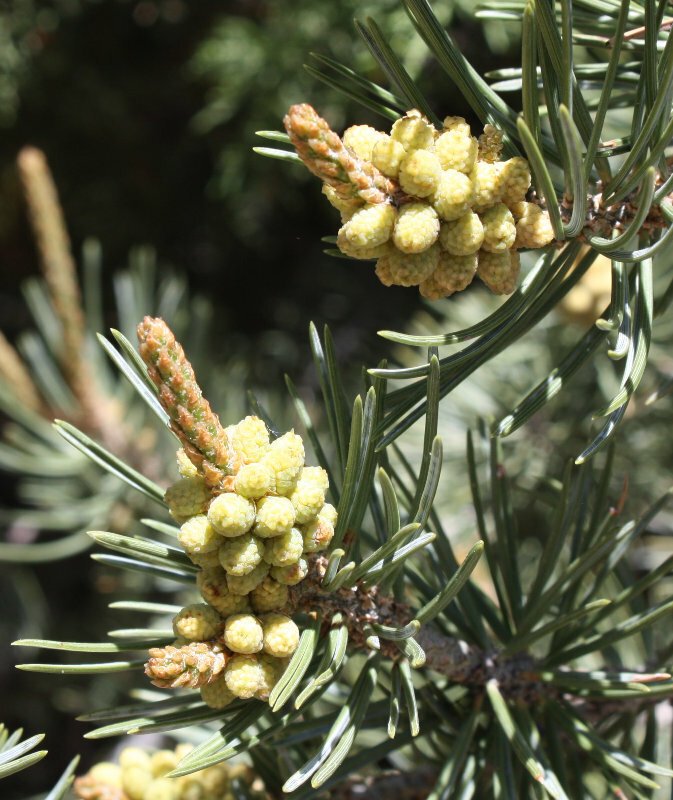 What I didn't realize was that these little red-brown cones are all the male, pollen-bearing cones. 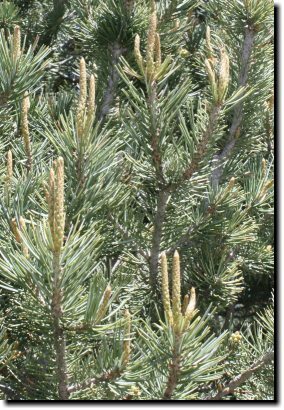 The ones that bear the seeds, apparently, are the larger bright green cones, and we don't have many of those. But maybe they're just small now, and there will be more later. Keeping fingers crossed. 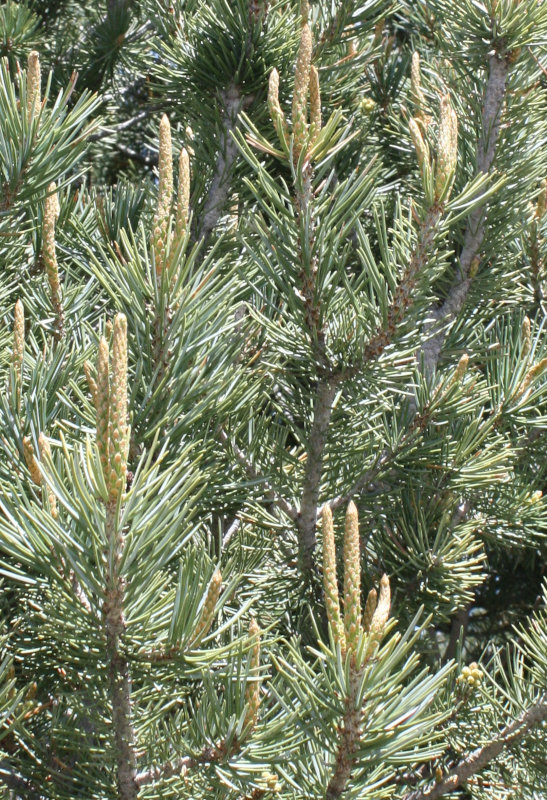 The tall spikes of new growth are called "candles" and there are lots of those, so I guess the trees are happy. Other plants besides cacti are blooming. 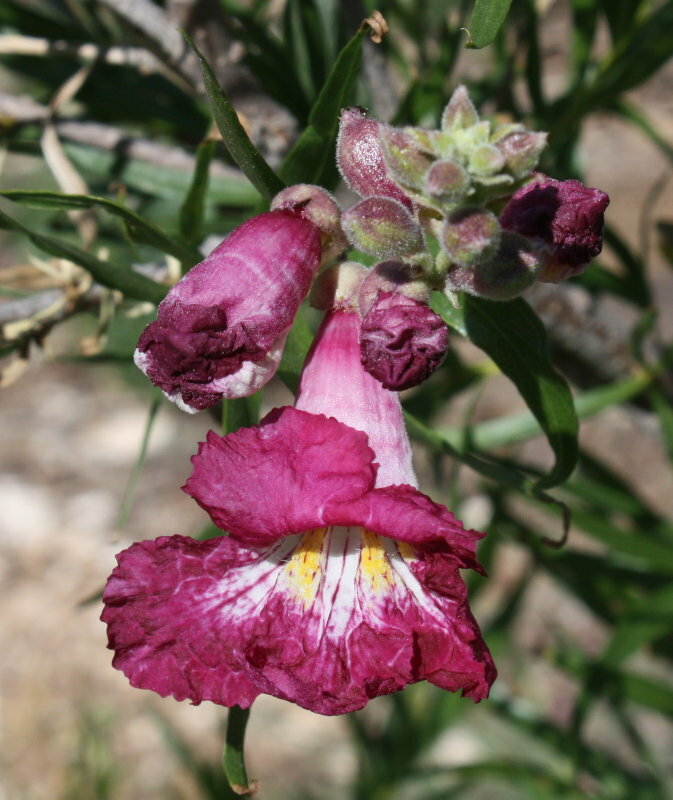 Last fall we planted a desert willow from a local native plant nursery. The desert willow isn't actually native to White Rock -- we're around the upper end of its elevation range -- but we missed the Mojave desert willow we'd planted back in San Jose, and wanted to try one of the Southwest varieties here. Apparently they're all the same species, Chilopsis linearis. But we didn't expect the flowers to be so showy! A couple of blossoms just opened today for the first time, and they're as beautiful as any of the cultivated flowers in the garden. I think that means our willow is a 'Rio Salado' type. Not all the growing plants are good. We've been keeping ourselves busy pulling up tumbleweed (Russian thistle) and stickseed while they're young, trying to prevent them from seeding. But more on that in a separate post. As I write this, a bluebird is performing short aerobatic flights outside the window. Curiously, it's usually the female doing the showy flying; there's a male out there too, balancing himself on a piñon candle, but he doesn't seem to feel the need to show off. Is the female catching flies, showing off for the male, or just enjoying herself? I don't know, but I'm happy to have bluebirds around. Still no definite sign of whether anyone's nesting in our bluebird box. We have ash-throated flycatchers paired up nearby too, and I'm told they use bluebird boxes more than the bluebirds do. They're both beautiful birds, and welcome here. 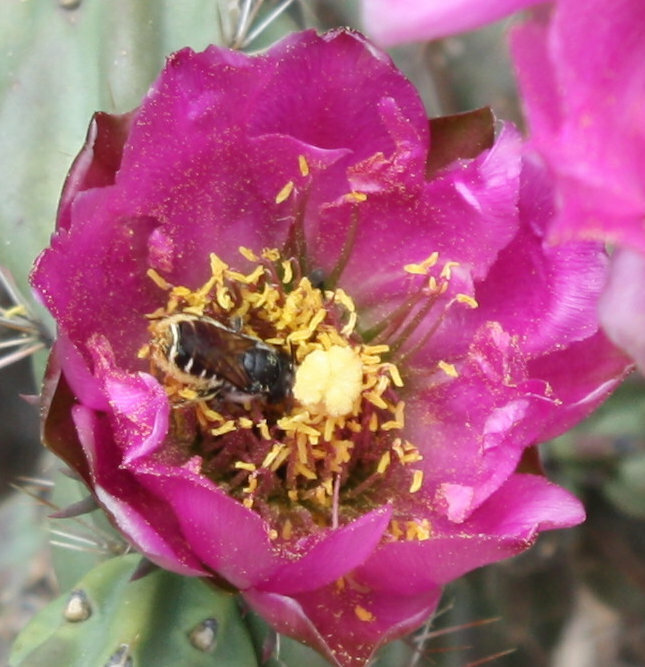 Image gallery: Chollas in bloom (and other early summer flowers. Although Ant builds have made Android development much easier, I've long been curious about the cross-platform phone development apps: you write a simple app in some common language, like HTML or Python, then run something that can turn it into apps on multiple mobile platforms, like Android, iOS, Blackberry, Windows phone, UbuntoOS, FirefoxOS or Tizen. Last week I tried two of the many cross-platform mobile frameworks: Kivy and PhoneGap. If you want to skip the gory details, skip to the summary: how do Kivy and PhoneGap compare? I tried PhoneGap first. It's based on Node.js, so the first step was installing that. Debian has packages for nodejs, so apt-get install nodejs npm nodejs-legacy did the trick. You need nodejs-legacy to get the "node" command, which you'll need for installing PhoneGap. Now comes a confusing part. You'll be using npm to install ... something. But depending on which tutorial you're following, it may tell you to install and use either phonegap or cordova. Cordova is an Apache project which is intertwined with PhoneGap. After reading all their FAQs on the subject, I'm as confused as ever about where PhoneGap ends and Cordova begins, which one is newer, which one is more open-source, whether I should say I'm developing in PhoneGap or Cordova, or even whether I should be asking questions on the #phonegap or #cordova channels on Freenode. (The one question I had, which came up later in the process, I asked on #phonegap and got a helpful answer very quickly.) Neither one is packaged in Debian. Error: Please install Android target: "android-22"
Apparently Cordova/Phonegap can only build with its own preferred version of android, which currently is 22. Editing files to specify android-19 didn't work for me; it just gave errors at a different point. So I fired up the Android SDK manager, selected android-22 for install, accepted the license ... and waited ... and waited. In the end it took over two hours to download the android-22 SDK; the system image is 13Gb! So that's a bit of a strike against PhoneGap. While I was waiting for android-22 to download, I took a look at Kivy. They have a nice quickstart tutorial for writing a Hello World app on their site. You write it, run it locally in python to bring up a window and see what the app will look like. But then the tutorial immediately jumps into more advanced programming without telling you how to build and deploy your Hello World. For Android, that information is in the Android Packaging Guide. They recommend an app called Buildozer (cute name), which you have to pull from git, build and install. got started on building ... but then I noticed that it was attempting to download and build its own version of apache ant (sort of a Java version of make). I already have ant -- I've been using it for weeks for building my own Java android apps. Why did it want a different version? Unlike a lot of Android build packages, buildozer will not inherit variables like ANDROID_SDK, ANDROID_NDK and ANDROID_HOME from your environment; you must edit buildozer.spec. kivy/graphics/vbo.c:1:2: error: #error Do not use this file, it is the result of a failed Cython compilation. I had to ask on #kivy to solve that one. It turns out that the current version of cython, 0.22, doesn't work with kivy stable. My choices were to uninstall kivy and pull the development version from git, or to uninstall cython and install version 0.21.2 via pip. I opted for the latter option. Either way, there's no "make clean", so removing the dist and build directories let me start over with the new cython. Buildozer was now happy, and proceeded to download and build Python-2.7.2, pygame and a large collection of other Python libraries for the ARM platform. Apparently each app packages the Python language and all libraries it needs into the Android .apk file. The buildozer.spec file offers two types of versioning: by default "method 1" is enabled, but I never figured out how to get past that error with "method 1" so I commented it out and uncommented "method 2". With that, I was finally able to build an Android package. The .apk file it created was quite large because of all the embedded Python libraries: for the little 77-line pong demo, /usr/share/kivy-examples/tutorials/pong in the Debian kivy-examples package, the apk came out 7.3Mb. For comparison, my FeedViewer native java app, roughly 2000 lines of Java plus a few XML files, produces a 44k apk. The next step was to make a real mini app. But when I looked through the Kivy examples, they all seemed highly specialized, and I couldn't find any documentation that addressed issues like what widgets were available or how to lay them out. How do I add a basic text widget? How do I put a button next to it? How do I get the app to launch in portrait rather than landscape mode? Is there any way to speed up the very slow initialization? I'd spent a few hours on Kivy and made a Hello World app, but I was having trouble figuring out how to do anything more. I needed a change of scenery. By this time, android-22 had finally finished downloading. I was ready to try PhoneGap again. worked fine. It took a long time, because it downloaded the huge gradle build system rather than using something simpler like ant. I already have a copy of gradle somewhere (I downloaded it for the OsmAnd build), but it's not in my path, and I was too beaten down by this point to figure out where it was and how to get cordova to point to it. Cordova eventually produced a 1.8Mb "hello world" apk -- a quarter the size of the Kivy package, though 20 times as big as a native Java app. Deployed on Android, it initialized much faster than the Kivy app, and came up in portrait mode but rotated correctly if I rotated the phone. My final apk, for a small web app I use regularly on Android, was almost the same size as their hello world example: 1.8Mb. And it works great: phonegap had no problem playing an audio clip, something that was tricky when I was trying to do the same thing from a native Android java WebView class. Summary: How do Kivy and PhoneGap compare? This has been a long article, I know. So how do Kivy and PhoneGap compare, and which one will I be using? They both need a large amount of disk space for the development environment. I wish I had good numbers to give you, but I was working with both systems at the same time, and their packages are scattered all over the disk so I haven't found a good way of measuring their size. I suspect PhoneGap is quite a bit bigger, because it uses gradle rather than ant and because it insists on android-22. On the other hand, PhoneGap wins big on packaged application size: its .apk files are a quarter the size of Kivy's. PhoneGap definitely wins on documentation. Kivy has seemingly lots of documentation, but its tutorials jumped around rather than following a logical sequence, and I had trouble finding answers to basic questions like "How do I display a text field with a button?" PhoneGap doesn't need that, because the UI is basic HTML and CSS -- limited though they are, at least most people know how to use them. Finally, PhoneGap wins on startup speed. For my very simple test app, startup was more or less immediate, while the Kivy Hello World app required several seconds of startup time on my Galaxy S4. Kivy is an interesting project. I like the ant-based build, the straightforward .spec file, and of course the Python language. But it still has some catching up to do in performance and documentation. For throwing together a simple app and packaging it for Android, I have to give the win to PhoneGap. This sign, in Santa Fe, always makes me do a double-take. 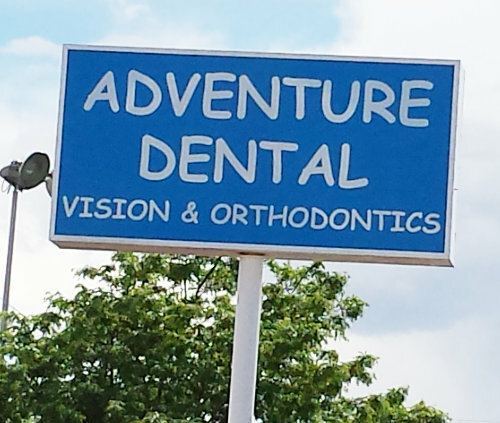 Would you go to a dentist or eye doctor named "Adventure Dental"? Personally, I prefer that my dental and vision visits are as un-adventurous as possible.